The REAL facts about Westhroid. Nature-Throid and Westhroid are identical formulations. Having one medication under two names caused some confusion; therefore, we made the decision to market under one name: Nature-Throid. Westhroid was one of the first hypothyroid medications and has never been recalled for inconsistent T4 or T3 hormones. Today the hypoallergenic, low-cost formula is still available at your local pharmacy in 5 strengths. Nature-Throid may be carried at more pharmacies and is available in 13 strengths. Due to the limited strengths of Westhroid, you may be interested in learning more about Nature-Throid. We also manufacture WP Thyroid, the purest thyroid medication formulated with only two all-natural inactive ingredients. Roll over the images below to zoom. Westhroid adheres to the full established United States Pharmacopeia (USP) monograph which indicates 38 mcg of levothyroxine (T4) and 9 mcg of liothyronine (T3) for each 65 mg of Thyroid USP. You are taking any other prescription or over-the-counter medications, or if you start or stop any medications while on Westhroid™. Let your dentist know you are taking Westhroid™ before any surgery. Do not take Westhroid™ either alone or in combination with other medicines, for the treatment of obesity or weight loss. In patients with normal thyroid levels, doses of Westhroid™ within the typical range used for hormone replacement are not effective for weight loss. Larger doses may result in serious or even life-threatening effects, especially when used in combination with certain other drugs used to reduce appetite. Do not take Westhroid™ for male or female infertility unless it is associated with hypothyroidism. Do not take Westhroid™ if you have hyperthyroidism or are allergic to any of its ingredients. Use Westhroid™ exactly as prescribed. Unless otherwise directed by your doctor, do not stop taking either medication or alter how often it’s taken. Many factors can contribute to the length of time symptoms are alleviated, though generally people feel an improvement within a few weeks. For some, though, improvement in symptoms may take up to three months. Your doctor will determine which dose is right for you. If any life changes or new symptoms occur, consult your doctor to adjust your dose. Continue to see your doctor until your dosage levels prove stable based on your lab work, then continue to see your doctor at their request. Thyroid replacement therapy is usually taken for life. Westhroid™ is thyroid replacement medication, containing standardized (T4) and (T3) hormones, used to treat hypothyroidism naturally; except in cases of temporary hypothyroidism, which is usually associated with an inflammation of the thyroid gland (thyroiditis). Thyroid replacement medication needs to be taken as prescribed by your physician and is typically taken for life. Do not take Westhroid™ either alone or in combination with other medicines for the treatment of obesity or weight loss. In patients with normal thyroid levels, doses of Westhroid™ within the typical range used for hormone replacement are not effective for weight loss. Larger doses may result in serious or even life-threatening effects, especially when used in combination with certain other drugs used to reduce appetite. Too much thyroid hormone may result in a hyperthyroid state. 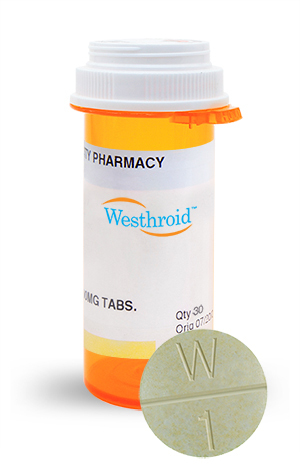 Westhroid™ Tablets ARE PRESCRIPTION MEDICATIONS. You are encouraged to report negative side effects of prescription drugs to the FDA. Visit www.fda.gov/medwatch or call 1-800-FDA-1088.